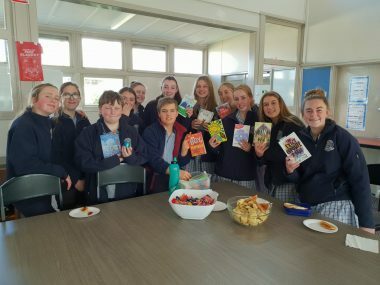 In Term 3 the lunchtime book club crew caught up to celebrate the end of the book they were reading in Term 1 and 2. During this celebration time they discussed several new books that had been brought along. A rigorous vote decided the book that they would read this term. As enthusiastic as they are, they started reading straight away. Students received new book marks and book badges declaring their love for books which students keenly displayed for the rest of the day. All students are welcome are to join in the laughs and discussion as we read each Thursday.